How did Greste end up in jail? Jump to media player Richard Galpin takes a look back at the arrest of journalist Peter Greste. 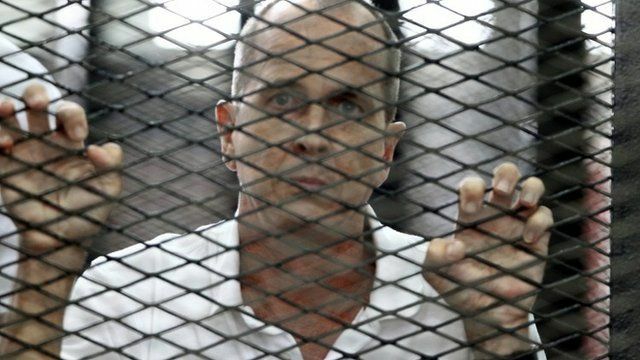 Sisi urged to free al-Jazeera's Greste Jump to media player The brothers of the jailed al-Jazeera journalist Peter Greste say they hope to see him deported back to Australia rather than face retrial. Greste parents: Retrial 'a good outcome' Jump to media player The decision to re-try three al-Jazeera journalists imprisoned in Egypt for over a year has been cautiously welcomed by the father of one of the men. Retrial in al-Jazeera Egypt case Jump to media player The highest court in Egypt has ordered a re-trial of three television journalists, Peter Greste, Mohamed Fahmy and Baher Mohamed, convicted of aiding the banned Muslim Brotherhood. 'They will still have to stay in Egypt' Jump to media player A defence lawyer involved in the case of three al-Jazeera journalists jailed in Egypt explains the process awaiting the men now a retrial has been ordered. Peter Greste 'now a free man' Jump to media player Jailed al-Jazeera journalist Peter Greste is being deported from Egypt, the state news agency and police say. Al-Jazeera journalist Peter Greste is being deported from Egypt. The Australian ex-BBC correspondent was arrested alongside Mohamed Fahmy and Baher Mohamed in December 2013. They were imprisoned last June on charges including spreading false news. Richard Galpin takes a look back at how it all began.